It has been a few months since my last post but I am leaving tomorrow for a return to a favorite southern Off-Road-Vehicle (ORV) park, Hawk Pride Mountain ORV Park, near Tuscumbia/Muscle Shoals, Alabama. It is time for the Louisiana Land Krewsers annual event, the Mardi Krawl. We really get excited about rocks down here Nawlins’ way! It is a seven-hour drive, which is also interesting as we climb from the pine barrens and wetlands of the coastal plain, sandwiched between the Mississippi River Delta and the Pearl River, which drains central Mississippi, into the low plateaus of the southern Appalachians (~800 feet elevation). 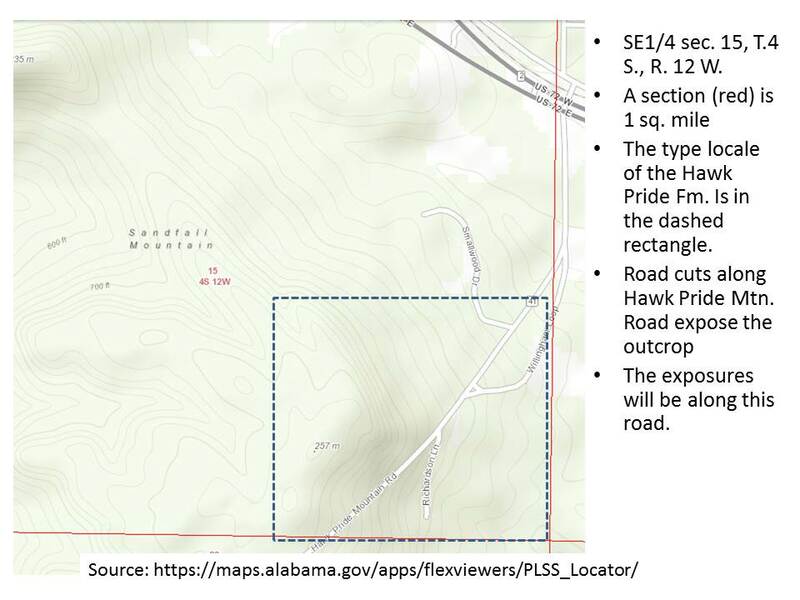 This post introduces the geology of northwest Alabama as it will be experienced while wheeling in the private park. The map below shows where we are headed way up north in Alabama. I call the park area the “Study Area” because this is the first time I have an objective and plan to use geologic mapping methods to collect data to be published on this blog. The objective is to find out why the “easy” route up the main park hill is impossible to climb when it rains…it is unbelievably muddy whereas the other side of the hollow is sandy and traversable. I will spend Thursday collecting data about the difference in the rocks (and thus traction) on opposite sides of the valley. 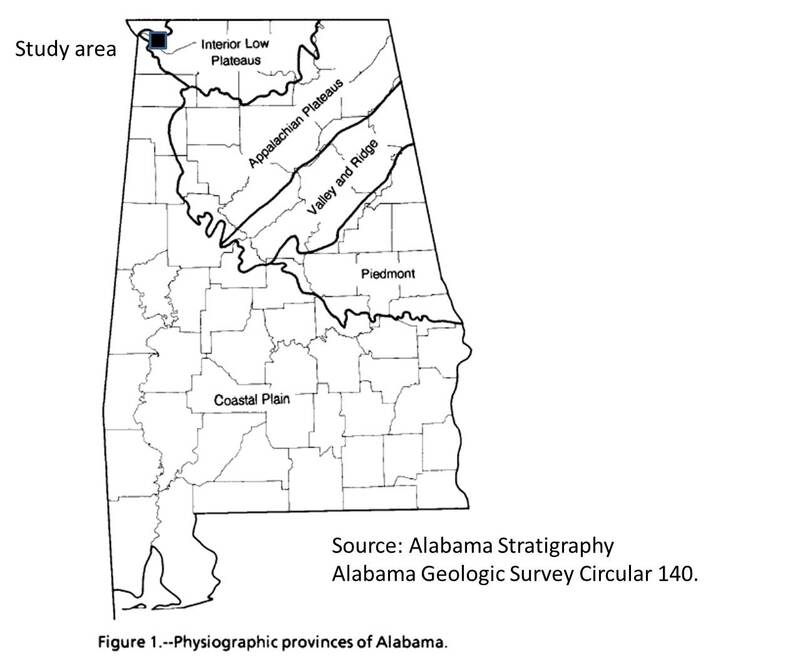 I am using basic geologist tools: a description of rocks from this region (Alabama Geologic Survey Circular 140); a 7.5 minute topographic map from USGS; rock hammer; weak hydrochloric acid (i.e. pool acid); a geology compass on my IPhone…I hope, but with a backup home-repair inclinometer and cub-scout compass; antique 10x eye glass (tiny view for individual minerals); and binoculars. 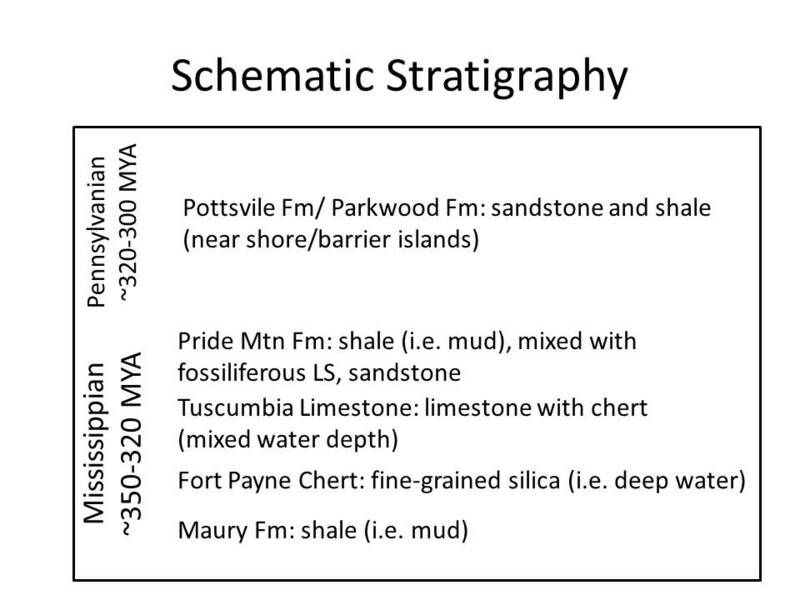 I couldn’t find a real stratigraphic chart for this area, where the exploitable resources are deep underground, so I pieced together this VERY schematic stratigraphy from the AGS 140. 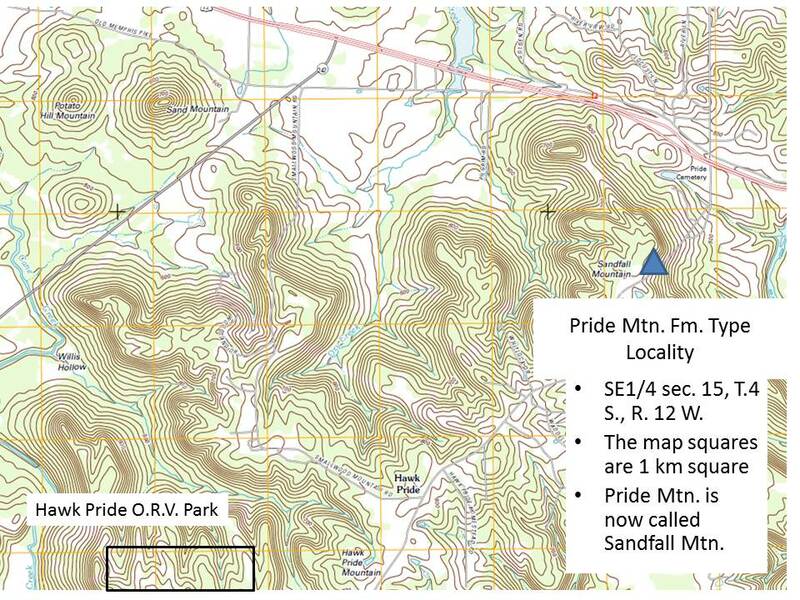 I am going to be focusing my attention during this trip on the Pride Mountain Formation (hereinafter PMF), which has its type locality (i.e. place where it was first described) very near the park. I am going to visit this site because it is located on Hawk Pride Mountain Road, which is how I will drive to the park…easy! I used township-range info from Alabama to find the approximate location, and the description from AGS-140, to find where to look for these exposures. The type-locality is very close to the park (a couple of miles) and it is likely found there as well. The topographic map below shows the proximity of the type-locality and the park, as well as the general topography of the area. This is an erosional terrain and significant faults are probably not present, but we will see! Only the northern end of the park is outlined in the image. 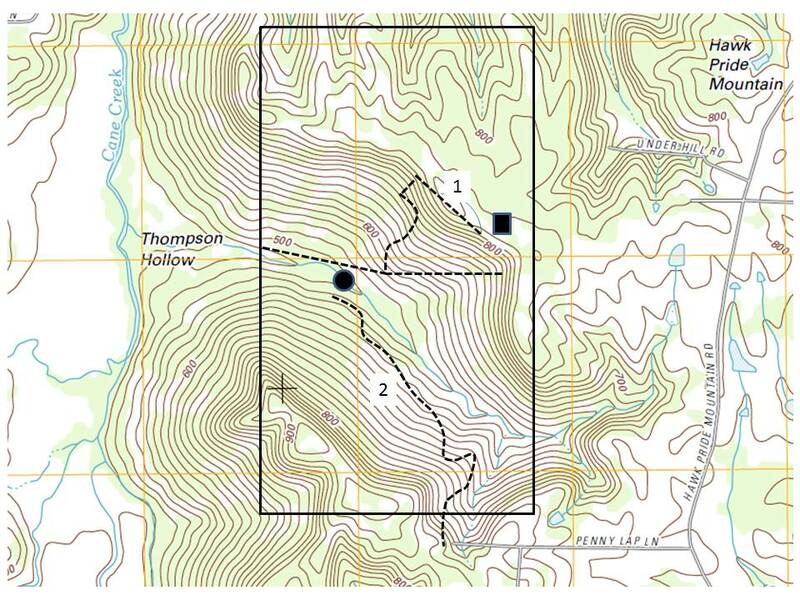 I will be collecting typical geologic data: strike and dip; lithology; and fossils, where they occur; on both sides of Thompson Hollow (see figure below), in order to discover if the shales of the PMF are not as prevalent on the south side of the park. With these data I hope to identify the formations and any unconformities between them that will help me understand why this park is so difficult to escape when it rains. I posted a Test message because WordPress was acting up! Anyway, as I was trying to say, I hope your excursion is safe and productive. I look forward to hearing about what you learn along the way!